Our society was built on a foundation of civil discourse – a skill that remains vitally important to this day. The people around us are our neighbors, and we must collectively strive to listen to and respect differing points of view in order for our society to work. Yet how can we ensure civility prevails as a societal virtue during an era of digital insults and political division? LakewoodAlive, a community-centered nonprofit organization, announces it will host a community forum – entitled Civil Discourse and Mutual Respect – from 7 to 8:30 p.m. on Tuesday, May 14, at Lakewood Public Library (15425 Detroit Avenue). This community conversation will offer insightful dialogue regarding how we can feel empowered to promote a society that values open-mindedness, politeness and respectful disagreement. Both the general public and members of the media are invited to attend this free forum as the community seeks to better understand the current state of civil discourse within our society and the importance of civility to our future. The discussion will delve into the consequences associated with dwindling decorum, the art of practicing intellectual humility, the threat posed by social media and best practices for promoting a more civil, respectful society. Judge Michael J. Ryan, a longtime judge within the Juvenile Division of the Cuyahoga County Court of Common Pleas, will oversee a distinguished group of panelists for an informative discussion. The final 30 minutes will be devoted to panelists fielding questions from the audience. – Edward Smith, former Foreign Service Officer & Diplomat, U.S. Department of State, and private sector development executive specializing in emerging economies, post conflict and potential conflict country environments. 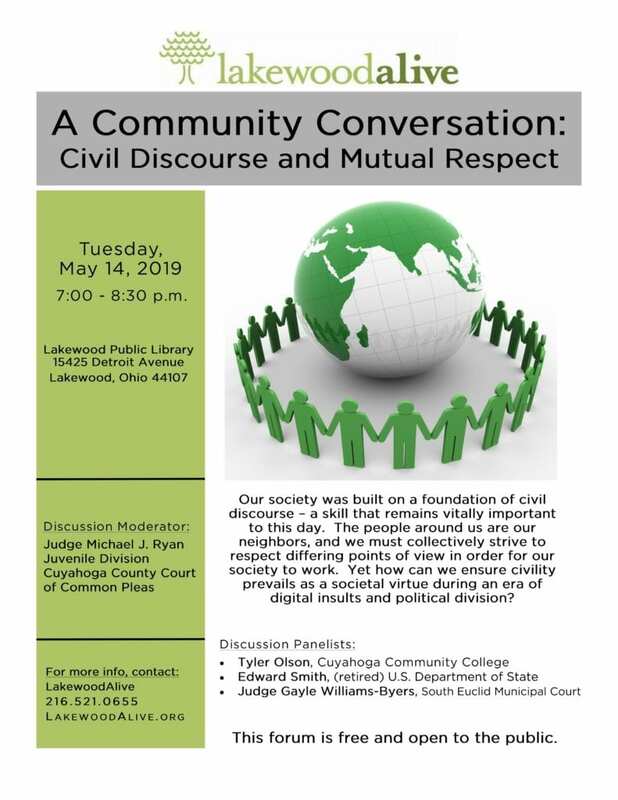 For more information regarding the Civil Discourse and Mutual Respect forum on May 14, please visit LakewoodAlive.org/CommunityForums or contact LakewoodAlive at 216-521-0655. An engaged and active citizen is our best asset, and LakewoodAlive works with partners throughout the community to publicly discuss the issues of the day. We regularly host Community Forums designed to provide access to experts and resources within a particular field, as well as engage our Lakewood neighbors in meaningful discussions regarding topics pertinent to our community. The following resources pertain to past forums LakewoodAlive has hosted. We hope you find them informative and useful. Lakewood Division of Aging LSC Service Corp.